Netflix is focusing on streaming video, the company’s obvious future. But stories of resistance from movie studios are well known. How is Netflix dealing with this problem? Streaming video is Netflix‘s future–it’s no secret, not to their customers, not to the press, and not to their peers. But the company’s difficulties in securing top-quality movies and TV shows from the studios to stream is well-documented. How is Netflix dealing with this problem? Smartly, it turns out. CNET explains some of the ways Netflix is working to make sure their streaming video service moves as fast as their customers. First, it’s a cyclical process. Mailing DVDs and Blu-ray discs out is far more expensive than streaming video, and it’s also less convenient for the consumer. The better Netflix’s streaming catalog is, the more people will use it, and consequently use their physical disc mailing service less. I can vouch for that–I use Netflix Instant Watch streaming nearly every day (I’ve given up cable) but have had the same three DVDs for months. When people use the mailing service less, Netflix can cut costs from that part of the business–which is exactly what happened. In the most recent financial quarter, Netflix spent $24 million on the physical disc part of their business, almost half of the $43 million the company spent in the year-ago quarter. And while Netflix’s monthly fee hasn’t changed, they’ve exploded in subscriber base size: In the last year, the company added 5 million new members, and predicts a possible 18.5 million subscribers by the year’s end. For comparison, Comcast, the country’s largest cable provider, has 24.6 million subscribers. 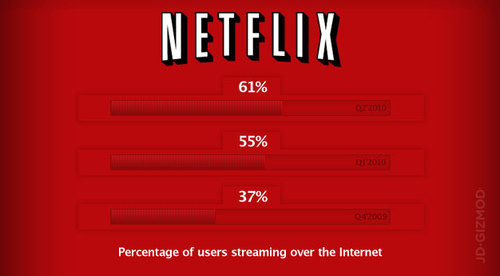 Netflix will probably top 20 million sometime next year, putting them right in the same category as Comcast. That’s a powerful position to be in. Netflix is also making deals advantageous to the studios. In agreeing to not rent any Warner Bros. movies for 28 days after their DVD release, Netflix got into that studio’s good graces. And now, with all the new revenue flowing in, Netflix is making friends the old-fashioned way: by buying them. In the most recent quarter, Netflix spent $66 million on streaming video acquisitions, more than seven times as much as it spent in the year-ago quarter. Netflix’s star is going to keep rising. They’re very simply the best movie distribution service we’ve ever seen, and these kinds of shrewd moves are going to keep them there.